The lure of Green Timbers is history, trout and, if your timing is right, large elk. 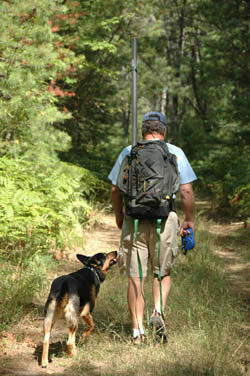 This rugged 6,388-acre tract, part of the Pigeon River Country State Forest, not only has wildlife, scenic vistas and blue ribbon trout streams but is also crisscrossed with a 10-mile unmarked trail system that appeals to hikers, backpackers and winter adventurers on snowshoes or backcountry skis. Click Here to order a detailed map of Green Timbers. The lure of Green Timbers is history, trout and, if your timing is right, large elk. This rugged 6,388-acre tract, part of the Pigeon River Country State Forest, not only has wildlife, scenic vistas and blue ribbon trout streams but is also crisscrossed with an unmarked trail system that appeals to hikers, backpackers and winter adventurers on snowshoes or backcountry skis. 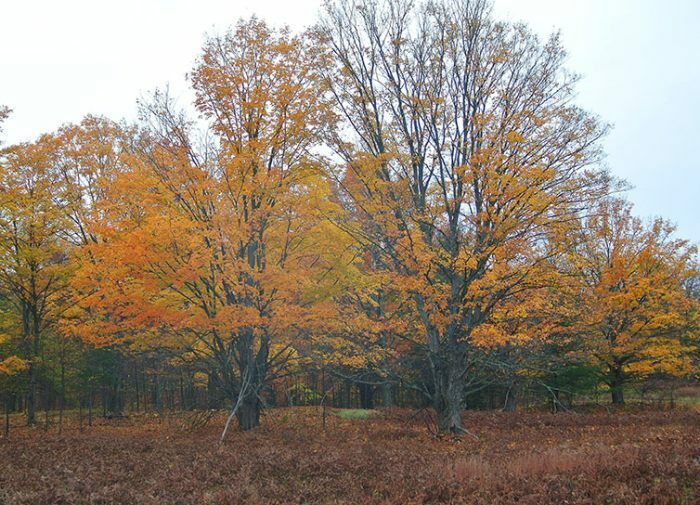 The 1918 successful reintroduction of elk to Michigan took place just 1.5 miles north of the tract, and Green Timbers has remained an important area for the species. Eventually much of the tract was logged by the Cornwall Lumber Company and then burned and used for grazing by both sheep and cattle before being purchased and named by Don McLouth in 1942. In the 1950s, McLouth turned the area into an hunting and fishing retreat for McLouth Steel employees that included the construction of a series of log cabins near the Sturgeon River. In 1982 the state took over the property as part of the Pigeon River Country State Forest and all the cabins have been removed. But where the Green Timbers Cabin once stood on the banks of the Sturgeon River and Honeymoon Cabin on the edge of a ridge, high above the Sturgeon River, are now popular places to camp. More than half of Green Timbers is covered with second growth forest of aspen, oak, other northern hardwoods and white and red pines. The 10-mile trail system in the recreation area is basically two tracks and old forest roads; some well established and easy to follow, many little more than overgrown trails used mainly by elk and deer. 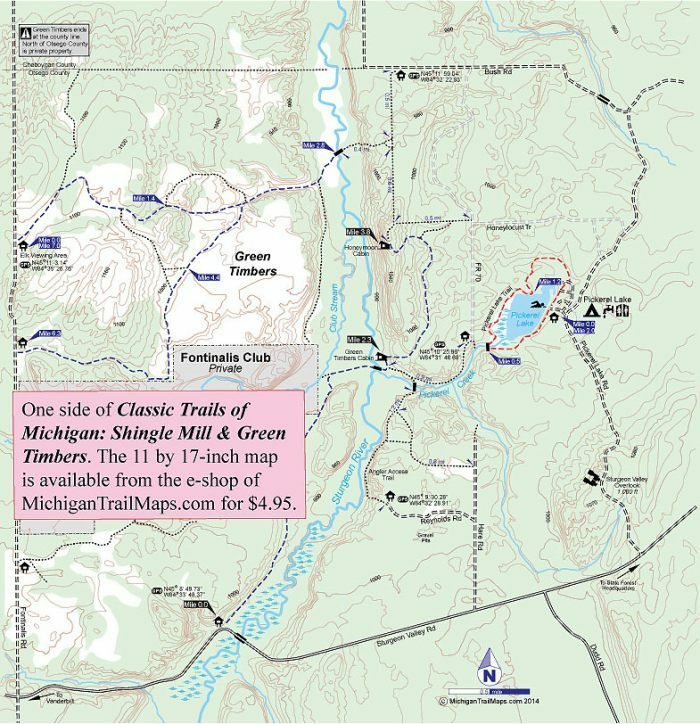 The trails are not marked and do not necessary correspond to the map available at the Pigeon River Country headquarters. The easiest route to follow, and thus the most popular one, is the trail from the Sturgeon Valley Road parking area to the site of the old Green Timbers Cabin, a trek of 2.3 miles. From here it is 1.5 miles to where Honeymoon Cabin once stood, a route that is only slightly more difficult to follow. Honeymoon Ridge is a more appealing place to spend a night and the easiest and quickest route to the high point is to begin at a trailhead on Bush Road (also referred to as County Line Road on some maps). From this parking area an easy-to-follow two-track heads due south to reach the cabin in roughly a mile. Keep in mind that Bush Road is not plowed during the winter it is usually impossible to reach this trailhead. The most popular angler access is the west end of Reynolds Road, reached from Sturgeon Valley Road via Hare Road. A small parking area is located here and from it a short trail descends to the Sturgeon River. The entire Sturgeon Valley watershed, including the Sturgeon River, Club Stream and Pickerel Creek, are popular among fly anglers for its healthy populations of brook, brown and rainbow trout. The trails on the west side of the Sturgeon River are best reached from an Elk Viewing Area parking lot off Fontinalis Road or from the Bush Road trailhead and utilizing an old vehicle bridge across the Sturgeon River. Click Here to order a detailed Green Timbers map. Other than trailhead parking areas, there are no facilities in Green Timbers. That includes campgrounds, vault toilets or sources of safe drinking water. 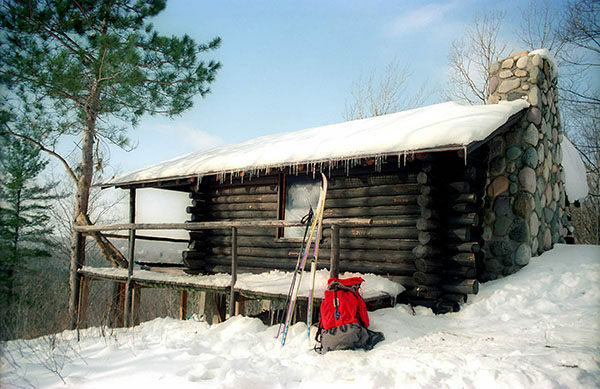 For additional information stop or call the Pigeon River Country State Forest Headquarters (989-983-4101), an impressive log lodge on Twin Lakes Road. For travel information contact the Gaylord Convention and Visitors Bureau (800-345-8621).